I fell in love with the card that Becca created and even though my card is not exactly like hers, I loved some of her ideas. 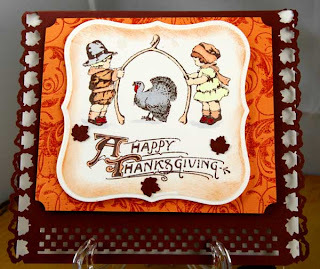 I stamped the image from Crafty Secret's Thanksgiving Stamp set and color the images with my Copic markers. It was cut and embossed with with Spellbinders Label One Nesties. Before removing it from the die, I sponged the edges with my large daubers using Antique Linen by Ranger. I inked one side of Spellbinders Flourish Impressibilities using a Brayer and the Daubers with Memento Rich Cocoa and ran it through my Cuttlebug. The color is brown IRL, but it looks red here and no matter what I did with my camera is still isn't the true color. I used the Ticket Punch from SU on the corners. Martha Stewart Leaf Edger Punch was used on the sides and then on the bottom I used my new Martha Stewart Checkerboard Edger punch on the bottom for a different look. I love this new punch and I can see it will get lots of use. The little leaves that I punched out were used for an accent on the stamped image and also on the inside of the card. The image and the Impressibility were attached with Therm-O-Web Dimensionals. I love the look of a raised image, how about you? I think it gives a bigger impact. a verse from the Thanksgiving set. Joan...totally LOVE this image! gorgeous card! This is so cute Joan. Gosh, you really put a lot of work in on this one.